Weiner describes a temple in Delhi, a bookstore in Portland, even the airport in Hong Kong as Thin Places. So, as we walked east on our street this afternoon, thrilling to the sight of brown grass and bare trees, we tried to think of Thin Places: The temple at Shantivanam, with its smells and bells? the restaurant at the top of Naxos, that served such amazing Loukoumades with drizzled honey? 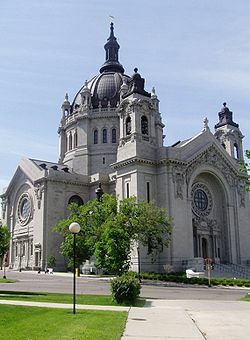 Continuing east, we came to the Cathedral of St Paul. We went in as Vespers began, and stayed through the Magnificat.